These badges were available with their corresponding book. The I-SPY books are spotter’s guides written for British children, and particularly successful in the 1950s and 1960s. 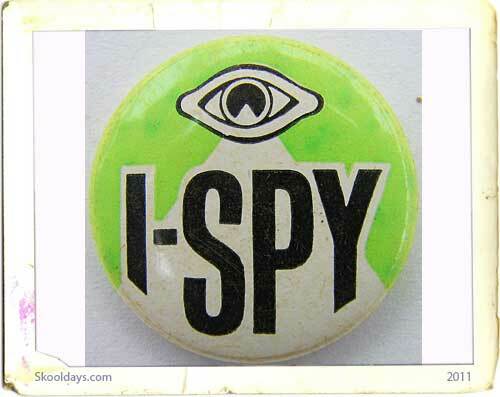 The I-SPY Tribe was based on the I-SPY Books, some forty small volumes that sold in hundreds of thousands. Each book covered a subject such as I-SPY Cars, I-SPY on the Pavement, I-SPY Churches, I-SPY on a Train Journey, etc. As children spotted objects such as coalhole covers, oak trees, semaphore signals, fire engines, whelks, and so on, they recorded the event in the relevant book, and gained points. Once the book was complete, it could be sent to Big Chief I-SPY for a feather and order of merit. The company was supposedly run by a Red Indian chief called Big Chief I-Spy. The original Big Chief I-Spy was Charles Warrell, a former headmaster who created I-Spy towards the end of his working life. He retired in 1956, but lived on until 1995 when he died at the age of 106. After Warrell’s retirement his assistant Arnold Cawthrow became the second Big Chief, and served in this role until 1978. For part of this time he also worked as an antiques dealer in Islington. Members of the I-Spy Tribe were called Redskins, and the head office was variously known as the Wigwam by the Water or the Wigwam-by-the-Green. The former was located for some years next to the Mermaid Theatre at Blackfriars, while the latter was in London’s Edgware Road. The books were originally self-published by Charles Warrell but, after a brief period when they were published by the Daily Mail, they were taken over by the now defunct News Chronicle newspaper and based in the paper’s building in Bouverie Street. The regular I-SPY column, which appeared in the News Chronicle, reverted to the Daily Mail when the News Chronicle ceased publication, and continued to appear until the late 1980s The books have had various publishers over the years including the Dickens Press, a company set up to continue the book publishing interests of the ‘News Chronicle’ and Polystyle Publications, a publisher of children’s comics. 31 books were released in the range upto the 1980s. Rumor has it, a further six are planned for summer 2011. The I-Spy format has also extended to cover individual museums, galleries, parks and other specific applications. Arnold Cawthrow died in 1993, and is commemorated by a stone plaque placed on the outside of the Boatmen’s Rooms, the house where he spent some of his last years in Deal, Kent. The books became very popular, with print runs well into six figures. Big Chief I-Spy had a succession of assistants, usually known as “Hawkeye”. In the early 1970s, this position was held by Ralph Mills. Earlier assistants included Max Heinz and John Tagholm. In the 1980s, following a short-lived third Big Chief, Robin Tucek, David Bellamy replaced Big Chief I-Spy as the person to whom completed books were sent, and the earlier Red Indian connections were quietly dropped. I-Spy books were still being sold, until recently, by Michelin Travel Publications and there has been talk of Michelin licensing the I-SPY brand to another publisher in the future. This entry was posted in Pop Culture and tagged 1950, 1960, 1970 by Skooldays. Bookmark the permalink. Great news I-Spy fans, a new collection of Michelin's I-Spy books hit stores today!